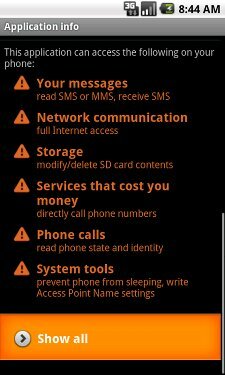 BeanBot.A forwards device's data to a remote server and sends out premium-rate SMS messages from the infected device. Once the scan is complete, the F-Secure security product will ask if you want to uninstall the file, move it to the quarantine or keep it installed on your device. Additionally, BeanBot.A also sends out premium-rate SMS messages from the infected device, leaving the user with a hefty bill charged to his or her account.